It really hurts to see a large pie of the salary cut towards tax. So the obvious question in everyone’s mind is ‘How do I reduce my tax?’. Every year we are forced to invest in something which reduces our tax liability. It may be NSC…it may be PPF…it may be ulip…it may be Mutual Fund ELSS. These tax saving investments are at times taken based on advice from colleagues or friends. Generally investors tick the scheme if it helps to reduce tax liability. Apart from reducing tax, there are some other questions to be asked. Are the returns from the scheme taxable? Do I need to make investment in this scheme every year or just a one time investment? Does it support my financial goals? Apart from tax saving investments is there anything to be considered in tax planning? 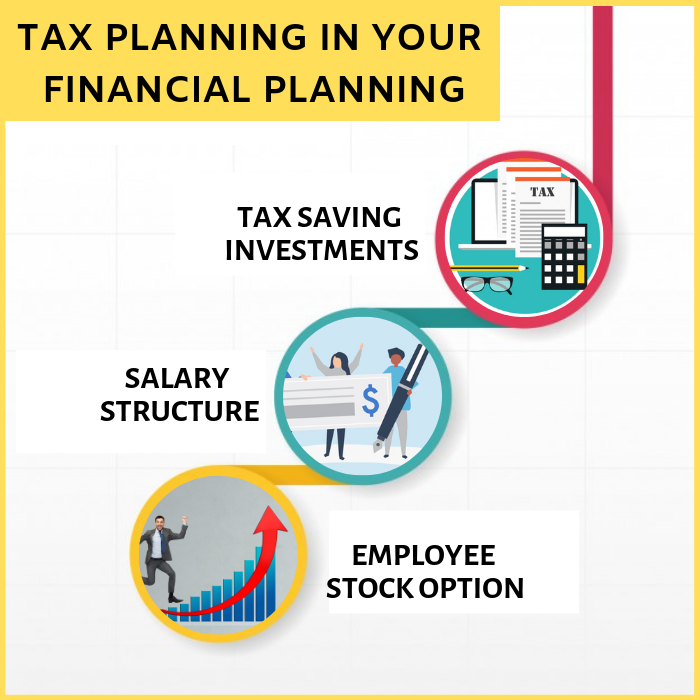 Tax Planning is also a part of your overall financial planning. When tax planning is done in your financial planning, it plans tax in a much broader perspective. This is the most obvious one. In order to reduce the tax liability, where you need to invest will be answered here. This deals with the investments under section 80C. Also it covers section 80D and the housing loan interest for tax saving purpose. When these tax saving investments are made or selected based on your financial plan, these schemes will not only save your tax, it will also help you achieve your life financial goals like children’s future need or retirement plan. Also the tax saving investment scheme selected may change every year depending on the requirement of the financial plan. If in a particular year, you have more exposure in equity, then the financial planner may recommend you to invest in PPF. In another year, if you have less exposure in equity, he may ask you to invest in Mutual Fund ELSS. Tax planning will be different from year to year and person to person. Now-a-days employers provide some flexibility in structuring the salary of their employees. 60% to 70% of the salary will be given under the pre-determined heads. For the 30% to 40% of the salary employers will give you some flexibility. That is you will be allowed to claim that portion of your salary under allowance A or allowance B or allowance C or as a combination of allowance A, B and C.
If your employers provide such flexibility then share the details with your financial planner. He will be able to tell you in what way you structure your salary that is going to be beneficial in reducing your overall tax burden. Your employer may introduce some superannuation scheme with some special tax benefits in which you contribute an X amount and your employer will also contribute equivalent to the X amount. When your employer introduces any such schemes, if you share the details with your financial planner, he will study the scheme and let you know whether it is a good scheme or not. If it is a good scheme, then is it suitable to you or not? If it is suitable to you then how much you can contribute towards the scheme? Many employees are clueless what to do, when employer introduces such schemes. If you opt to do your tax plan in sync with your financial plan then all these problems will be solved. When employers allot some of their shares to its employees by way of Employee Stock Option (ESOP), they generally announce some packages. That is the employee will get x number of shares free and y number of shares can be allotted at a subsidized rate. Also there will be some lock in period for these shares. After the lock in period the shares can be transferred to your demat account or the employers can sell those shares and give you the money. Again here, if you share these ESOP package details to your financial planner, he will be able to tell you in what way you claim you ESOP then that is going to be tax advantageous to you. Also he will check in what way these ESOP will help you achieve your life financial goals. From the financial planning point of view, tax planning has got much broader perspective. Generally tax planning will be done as a part of financial planning. Tax planning is covered under financial planning. But tax filing is not covered in financial planning. However, financial planner may do that tax filing service also with an additional charge.